You cannot default any "opt-in" fields for consent to market to "consent". If you want to store someone's information for general processing of their data, you should ask for that. If you also want to market to them, you need to separately (unbundled) ask them to opt-in to that. To reliably track consent in Syncro, we have provided a few new features. 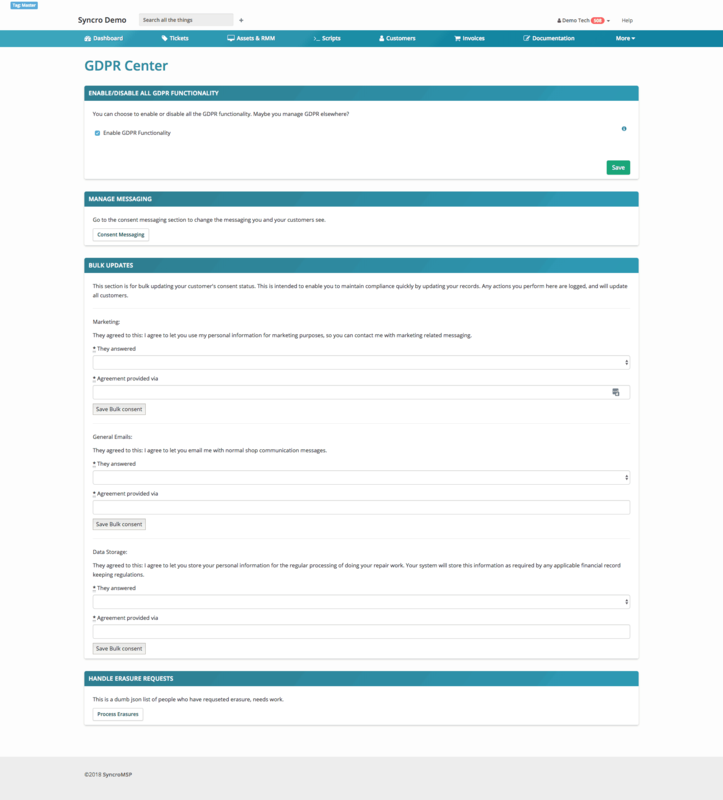 First, you can now head to the GDPR Center in the Administration section and configure your consent messaging. We have provided some sample text so you have an idea of what belongs in this message. After you have that configured, you might notice the three new fields on the "New Customer" screen, where the old "opt-in" checkboxes were. If you don't check the first box that says you have their consent to at least store their information for normal business processes, the form won't be valid to continue. If you do check any of these boxes and continue, a "Consent" record is stored in the database permanently for your future reference. The consent record will store the date and time, the communication method note you provide (ex; "verbally consented"), and a copy of the actual text they agreed to. To be reminded of the exact text you want them to agree to, you can hover over each field and the consent text you put in the prior step will pop up. In case you've already been collecting consent outside of Syncro, or you are importing Customers that have consented elsewhere, we've provided a bulk consent tool. This tool is in Admin -> GDPR Center. It allows you to mass-update each type of consent for all Customers in the database. Your Customers can use the Portal to manage their communication settings. They will have a new link in the upper right-hand corner of the Portal which will take them to a page where they can manage their Privacy Settings - Data and Communication Settings. A person should be able to get a "portable" (machine-readable format) copy of the personal data you're storing about them whenever they desire. We enable that in the Customer Portal. They can click into the Portal, click "Privacy Settings" in the upper right-hand corner, and click to "request data." You can also easily do this for them by clicking the "Online profile" link from the Customer Detail screen and clicking the "request data" button. First, in the Customer Portal they can click "Erase Me" and it will NOT actually erase them, but it will send you a request via a Ticket so you can choose how to process it. Second, on the Customer Detail screen, when you click to "GDPR", you get some controls on the page that are dynamic, based on what data is present on this Customer. If it's just an empty Customer, with no Tickets or Invoices, there will be a button allowing you to delete them and do an actual "Purge" - this is completely irreversible. If this Customer has any Tickets or Invoices, the button will change to "Soft Delete - Keep financial records due to other record keeping rules." This will "erase" them in many functional ways, but the Ticket/Invoice data will still be in the system and discoverable. They will not be able to receive emails in this state, and will not be present in Customer CSV Exports, so you won't accidentally contact them in the future. We don't provide a tool for this, but if Syncro is breached you can be sure we will report to you per the GDPR rules. We can't offer specific legal advice here, but you may want to have a policy ready that says how you will respond to a breach. We feel it's a little unclear if every small business needs to build all these policies. Syncro will publish a list of relevant hosts and services online here. may refer your Customers to this or create your own pages. We are not 100% clear what would make you compliant in this regard.